I have never got on with Pronterface to be honest, I remember having issues with it and my Ormerod. Once I switched to Daves firmware and the web interface, I never looked back. I will maybe give Cura/Repetier Host a try and at some point down the road I may look at doing a custom web interface for the Smoothieboard. As for the CP, it's at least printing, just needs some more tweaking. I did a very similar same thing when I first started using them. I bought just the delrin wheel from OpenBuilds as I had the bearings in stock. I tried to use a normal washer. It didn't work! I ended up buying the correct shim and spacer and all was well but it ended up costing me more than buying the kit in the first place due to shipping and customs costs. We live and learn! Glad you sorted it out. I've just uploaded Rich Cattell's new 'testing' version of Marlin into one of my Cherry Pi builds. I took advantage of the fact that I now use an all metal hotend and a Mk3 aluminium build plate. I made a lead from a couple of croc clips. Clipped one to the hot end and one to the bed and the other ends went to the Z Min connector on my RAMPS. When the nozzle touches the bed the 'switch' closes. I successfully ran Rich's G30 A auto calibration routine and it was spot on. I'm a great believer in the fact that once a delta is properly calibrated it shouldn't need auto bed leveling routines. Just the odd tweak to the Z height using M666 H should be all that's required. It's saved me an hour or so of manual calibration too! Did you know that OOZnest have the Openbuilds wheels in stock in the UK at £3 ea? Will that fit on the standard cherry pi lll mount. I didn't but I'll check them out. Thank you. What do you use to attach the fan to it. Also can you post a picture of it completely setup thanks. I will have to get some alu tube aswell then. You will need three lengths of 6mm OD tube 30mm in length, 3 x M3 50mm screws and 3 x M3 nuts. You can get the tube on the screws and fixings isle in B&Q. It's about £3.00 for a 1M length. Edited 1 time(s). Last edit at 02/02/2015 02:16PM by AndyCart. Thanks how did you mount the fan to it. What's the diameter of that heated bed Andy? Do you need a fan for the alu fins and also a separate one to blow onto the plastic as it comes out. I printed 210c pla 80% infill 0.2 mm .came out fine.if you pm me email I can send you a picture of it. Where are you I may be able to help you with some.? Abs temps depend on the filament that you are using I normally print at 235 110 onto clean Kapton Tape (Cleaned with acetone) this however is not on a cherry pi I am still building my Larger slice of Pi. A lot can also depend on the Hotend as well. You definitely need a fan to cool the cold side of the hotend. My design doesn't allow for a part cooling fan but if you look further up the posts (Page 12) you will see a picture of 'Adalina the Singing Dragon' that I printed in PLA with this setup. Came out great. Edited 1 time(s). Last edit at 02/04/2015 07:18AM by AndyCart. I print with ABS on mine. I have an E3D Mk6 all-metal hotend, and as Andy said, I keep the little hotend fan running all the time. I have slic3r make a 4mm brim to help hold it down, and use hairspray on glass as a print surface. My temps are usually 90 degrees for the bed, 260 for the hotend. 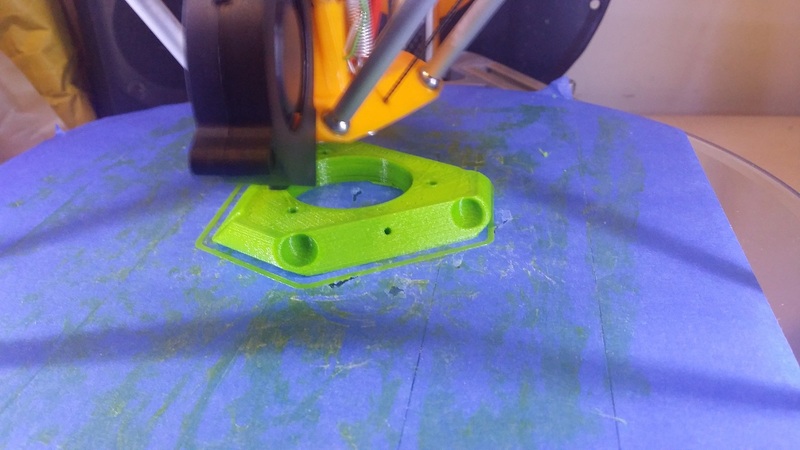 I still use the print cooling fan as needed, but typically turn it way down since it's not as necessary as with PLA.